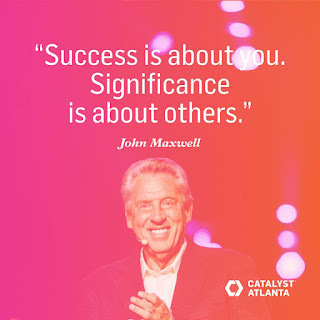 John Maxwell is a well known name in leadership. He used to be a Pastor, but after many years, stopped preaching and felt led to be in the business world. He has a gotten a lot of flack for that, but I believe he’s reaching the world for Christ just as much as he was before. He has a whole thing about living a significant life. Maxwell said, “The reason people don’t have a relationship with God is because they don’t know what He looks like. We are to be salt and light to make things better and brighter.” Boo-yah! I love that statement! Everyday we should do these things things, according to Maxwell, this is how he lives. NONE of those statements are about ourselves. It’s about others. People crave these things in their lives. If you help other people get what they want, they will help you get what you want. Everyone has a story, you either read or write your’s. Most people read it. Most people have good intentions but they’ve never gone from good intentions to good actions. 1. Value people: Correct or connect people. 2. Think of ways to add value to people; if we prepare them on the front end, we aren’t repairing them on the back end. 3. Look for ways to add value to people. 4. Do things that add value to people. 5. Encourage others to add value to people. Be consistent in these. Once you’ve tasted significance, success never satisfies! Living a life that is helping others is a positive life that will make an huge impact on the world. How are you living your life? Is it all about you? Are you striving for success? Maybe it’s time to rethink that idea. God tells us in the Bible to love our neighbor as ourselves. He wants to care for others, help the widows and orphans, treat people the way we want to be treated and live by Christ’s example. Let’s do that and change the world! Who’s with me? ← We need a GREAT awakening!